Modi Government is committed to empowerment of minorities with no discrimination and respect. 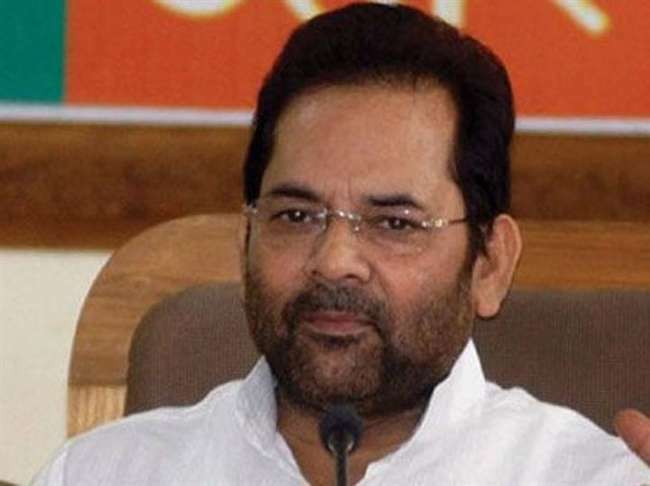 [New Delhi]: Union minister Mukhtar Abbas Naqvi has said that the poison that has been filled up in the minds of Muslims for the last 70 years has reduced to a great extent, but there is a lot to do to eliminate it altogether. He said that the Modi Government is committed to empowerment of minorities with no discrimination and respect. Naqvi said, "The development model of Modi government is not a deal of vote. During the last four years, the government has initiated a committed initiative for empowerment of the minorities whose impact on the ground is visible." He said that BJP will keep its efforts in front of the public for the purpose of the three divorces in the 2019 elections. The Union Minister said that due to the initiative of empowerment, the rate of dropout rate has decreased from 74 per cent to now 42 per cent among the Muslim girls. One of the main reasons for this is that 2.75 crore children have been given scholarship under direct cash transfer (DBT). Due to this the role of middlemen is over. Minority Affairs Minister said that the government has worked in providing employment and employment opportunities in different areas. Its poor and weaker sections have benefited a lot. This includes a large number of minority community people. He said that from Prime Minister to all the government ministers, through continuous interaction and communication, efforts are being made to create an atmosphere of development and confidence among people of all sections of society. Referring to the activities of his ministry, Naqvi said that the work of development of infrastructure for education, health, water supply and skill development in the very populated areas of the country's backward and minorities through the Prime Minister's Public Development Program is. Under the Prime Minister's Public Development Program, the path of establishment of schools on the lines of Navodaya and Kendriya Vidyalay has reached. Under this scheme, buildings and community centers have been built in minority dominated areas. Keywords and identifiers in C language (module 6). Planning to buy new phone. Check out this one.